Over the weekend I finally got to see Italian filmmaker Elio Gelmini’s interview-styled documentary on American maverick filmmaker, Kenneth Anger. When I first learned of Anger Me‘s release earlier this year, I kept my eyes peeled for my online DVD rental site to add it to their roster. Once available, it was promptly bumped to the top of my list. 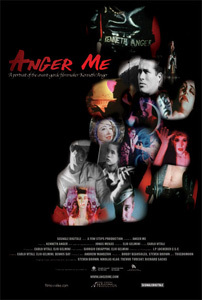 Throughout the film, Anger recalls his works, his travels and relationships, most notably with Dr. Alfred Kinsey, who was his first-ever customer, purchasing a copy of his first film, Fireworks for the Kinsey Institute. Naturally, a documentary on Kenneth Anger wouldn’t be complete without mention of Aleister Crowley. In addition to speaking about Crowley’s influence, the DVD bonus features include footage of Anger visiting Crowley’s one-time Italian villa, where, nearly 50 years ago, he’d scrubbed off the whitewash paint thrown over several of the magus’s murals by soldiers under Mussolini’s orders. With this documentary, and the two separate volumes of restored films made earlier this year for the first time on DVD, it’s safe to say that 2007 is the year of digital Anger. Let’s hope restored versions of Hollywood Babylon (I and II) see their day on DVD, too. There are no comments yet. You could be the first! © Gordasm. Powered by WordPress using the DePo Skinny Theme.